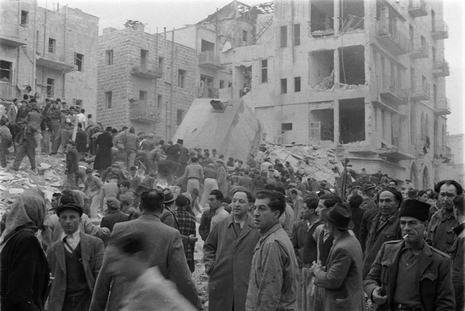 On February 22, 1948, as the conflict over the coming partition of Palestine grew, three British Army trucks led by an armoured car driven by Arab irregulars and British deserters exploded on Ben Yehuda Street killing 52 Jewish civilians and leaving 123 injured. 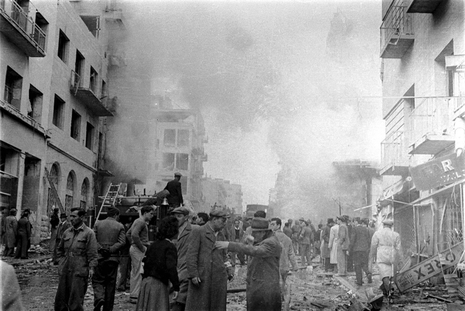 A statement issued the following day in Jerusalem claimed that the explosions where in retaliation for an Irgun bomb attack in Ramla. Two British deserters (Eddie Brown, a police captain who claimed that the Irgun had killed his brother, and Peter Madison, an army corporal) were involved in the attack, having been promised pay by Abd al-Kader al-Husseini, who was the commander of the Holy War Army forces in the area. The British were also blamed because armored trucks with police insignia had escorted the truck bombs into the area. By February 25th seven British soldiers had been killed in revenge attacks. On 29 February the Irgun blew up the Cairo to Haifa train at Rehovoth killing 29 British soldiers. The Irgun announcement said the bombing was in retaliation for the Jerusalem attack. 35 soldiers and 100 civilians were injured.